Try your hand at poster printing in this design workshop inspired by the art of Abram Games. Make your own foam stamps and print a design of colourful, bold shapes. Then add a catchy slogan with stencilled or stamped letters. Get creative and use the art of persuasion to spread your message loud and clear! Drop-in sessions run from 11am to 1pm and from 2pm to 4pm. Family activities are limited and available on a first come, first served basis. Children must be accompanied by a responsible adult. This major exhibition explores the life and legacy of the iconic designer Abram Games, focusing on his time as ‘Official War Poster Artist’ during the Second World War. 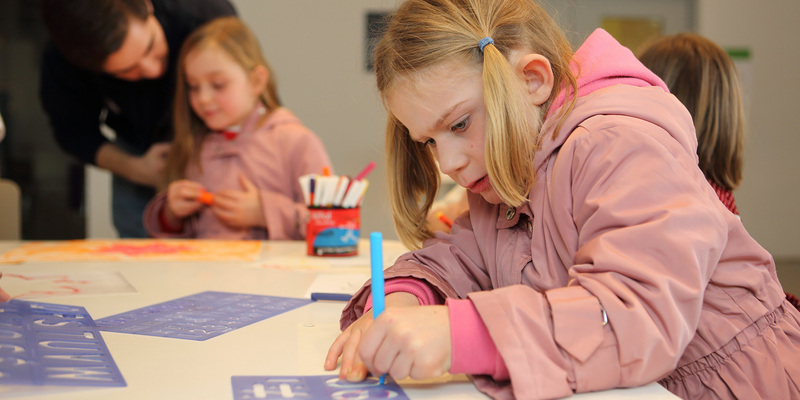 Pick a colour, grab a blow pen and get creative with our giant poster half-term activity.